How do you deal with deviations and changes? Are your systems in a qualified condition? Do you have data integrity under control? 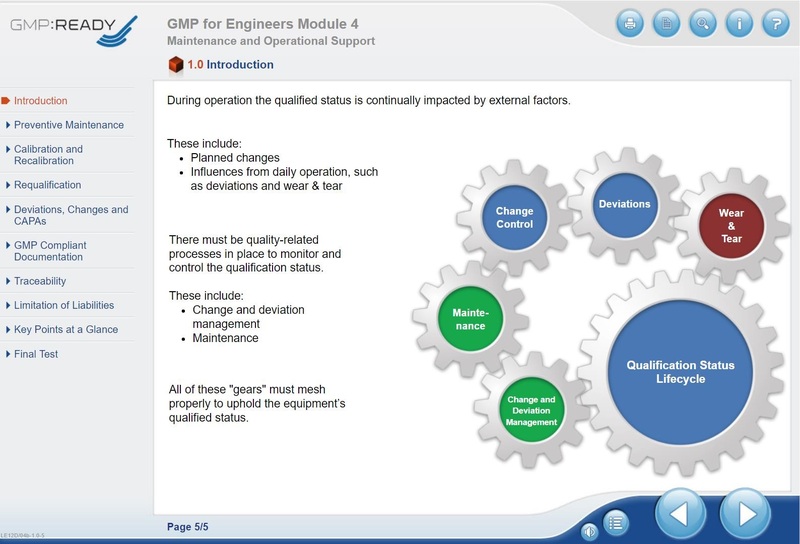 In this e-learning course you will learn more about preventive maintenance, the procedure for deviations, changes and CAPA and the topics of re-qualification and GMP-compliant documentation during plant operation. Even with a pharmaceutical manufacturing facility, it is necessary to take regular action to avoid wear and tear and to carry out necessary modifications and maintenance work to maintain the target condition. Only regularly maintained systems and equipment fulfil the intended purpose, i.e. are in a qualified condition. A maintenance concept should contain an optimal mixture of failure elimination, preventive, condition-oriented, predictive and risk-based maintenance in order to ensure maximum availability. 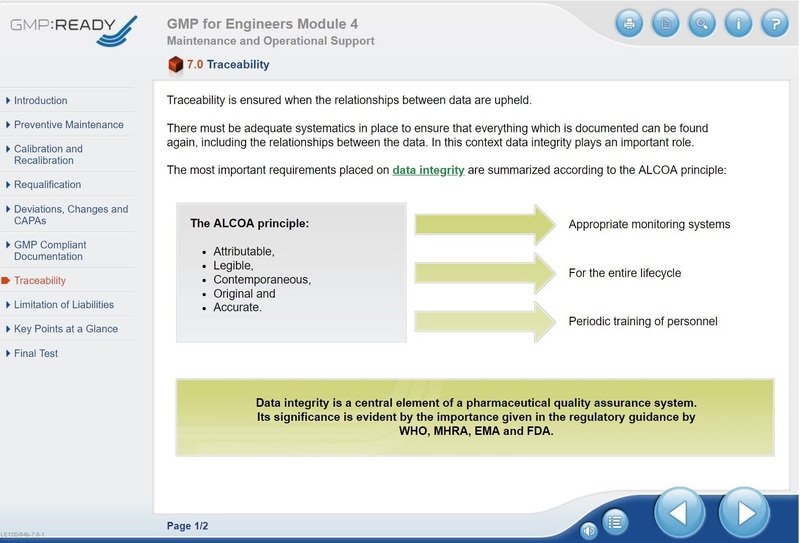 Data integrity is also a central element of the pharmaceutical quality assurance system. The importance is reflected in regulatory documents of the WHO, MHRA, EMA and FDA and is summarized in this course unit. Learning Goal: Learn about preventive maintenance, the procedure for deviations, changes and CAPA and the topics of requalification and GMP-compliant documentation during plant operation. Processing Time: Approx. 45 min. With GMP:READY you can train yourself and your employees in an uncomplicated, high-quality and flexible way. 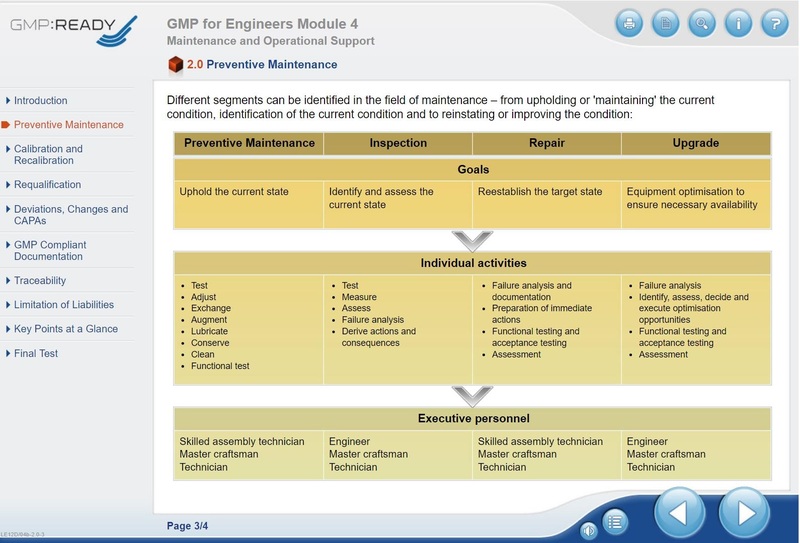 You can easily access the e-learning tool GMP:READY - GMP for Engineers on the internet via user name/password. Important: User name and password will be set up for the designated trainee. End-user has to be specified when placing the order! The GMP Compliance Adviser was used as the basis for these learning units. Some of the texts and examples were adopted. Would you like to train a larger number of employees with this tool? Please contact us to obtain more information about our services and products. We will provide an individual quotation tailored to your specific requirements.